Prepare pickled onions: Thinly slice the onions and put into a pickling jar or a small bowl. In a separate microwavable bowl or measuring cup, mix the two vinegars and microwave for two and a half minutes. Meanwhile, toss the garlic, mustard, and salt and pepper in with the onions. Pour the hot vinegar over the onion mixture and allow to sit at room temperature for a few hours. Serve or refrigerate for up to a few weeks. 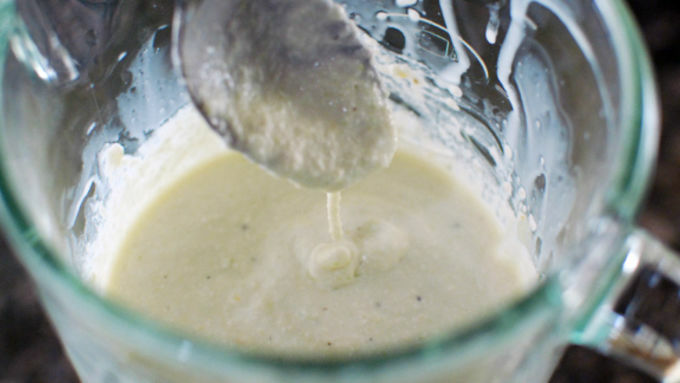 Make the sauce: In a blender, combine the habaneros, cheese, milk, onion, and garlic. Season with salt and pepper, and blend until smooth. 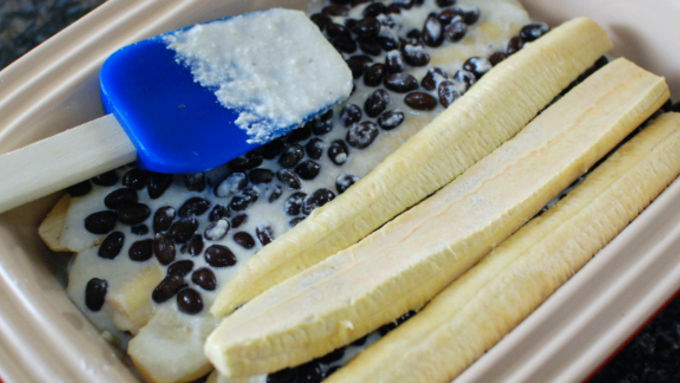 Build the casserole: Remove the skin from the plantains. Slice the plantains the long way. 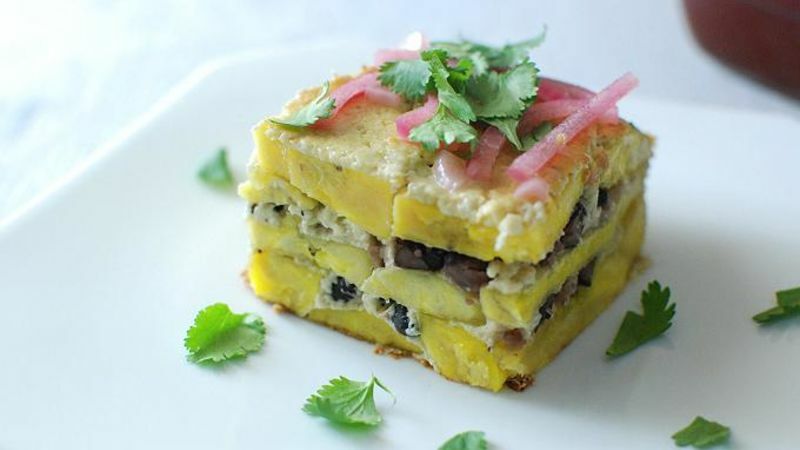 Build the casserole almost like a lasagna, laying down sheets of plantain, then alternating with cheese sauce and black beans. Top with the rest of the cheese and bake at 350°F for an hour and a half. Depending on how ripe your plantains are, you might need more or less time. Stick a knife into the center and if it goes in smoothly, the casserole is done. Allow to cool 15 minutes before slicing. Top with the pickled onion and some chopped cilantro and serve. 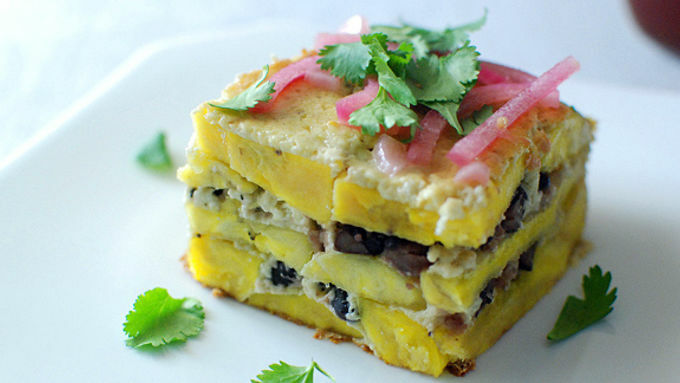 Plantain slices layer with cheesy sauce and beans for a dish that tastes so exotic, yet so familiar too. I’ve seen a few recipes for a plantains au gratin recently but they only have a single layer of plantains. I really wanted to make it more of a deep layered dish that's creamy and cheesy. I've tried this a couple times before – this time I tried to really hone in on what is good about the dish. Hearty potato-like plantains, cheesy creamy goodness, and bright sour pickled onions. It came out great and would be a very memorable side dish to bring to a potluck or to serve with a chicken dinner! The sauce for this is really easy. It's based on the sauce for a Peruvian potato and egg salad. Habanero, queso blanco, garlic, onion, and evaporated milk in the blender. Plantains look a lot like mutant bananas, but you really can't interchange the two. Actually, plantains are much more similar to a potato! You need to make sure to get very ripe ones for this dish. Stores sell them green or yellow or even black, and you want to choose ones that are a blackish yellow. If they aren't at that stage yet, you can just buy them a week early and they'll ripen more at home. The plantains are super tender and absorb that yummy cheese sauce. This is a hearty side dish!